An all new Company developing an all new line of landscaping/gardening products. -Bioplastics based, sustainably produced, fully functioning plant growing systems, and plant growing containers! These are the new products, which "By The Way" will continually work toward drought proofing your crops by utilizing passive air moisture harvest, dew and rainwater collection, supplemental irrigation, and the most efficient moisture dynamic (on demand) delivery system that can be provided! This all new line of "TRULY self watering" plant containers and growing systems was developed in order to address the need for sustainable urban, and rural crop productions. While this new line of products is providing plants/crops with moisture control it will also mitigate issues from soil born diseases, pests and other plant growing stresses! Below is a representation of my flagship A R SuperPots TM model, 12"W x 16"L x 10 1/2"H designed to be inter-connectable and to fit into standard construction 12" or 16" framework spacing -raised bed frame, wall/fence structure, or even cantilever from deck, eave, or balcony. You may also utilize this model in your backyard garden or field! The design is such that any placement that you wish to make it an installation (either temporary or permanent) will boost your moisture control and ease your plant maintenance duties! 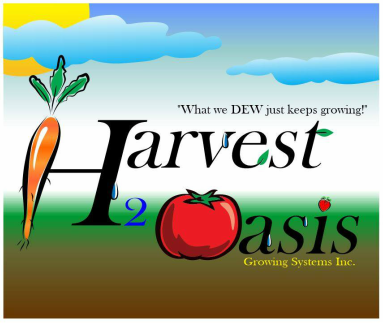 Many more Harvest 2 Oasis growing systems models, and products are currently underway! For a better view of the text descriptions below, press Ctrl + to ZOOM in! Take a look at the great infographics below; consider the benefits of incorporating the moisture dynamic reservoirs and the many features of A R SuperPots. Growing your plants in a raised bed system, or growing plants in your yard or garden will simply be more efficient! All of the advantages mentioned below are very true! Now if we take this to the next level of efficieny (with A R SuperPots) we have the best of all worlds in one simple plant growing system!